I recently made a video and how-too guide for Documentfreedom.org about how to watch videos on YouTube using HTML5. You can checkout that info here. The problem with the YouTube “trial” system is that it uses a cookie to record your “in the trial” status. Many of us who wish to join the future by using HTML5 for video and audio also like to clear out cookies regularly, to avoid being “followed” by creepy internet marketing people: however, by doing this we also clear the cookie which keeps them in the HTML5 trial. Below are two guides for how to keep the HTML5 trial cookie whilst deleting others. The first guide is simple and requires little future action, but less effective at isolating the cookie: the second guide is slightly less simple, requires more regular action in the future, targets the exact cookie for the HTML5 trial. This guide is only for Firefox users for now, but “Method Three” invites people to share there knowledge of how to achieve the same thing in other browsers, and through other methodologies. This first method is very simple. 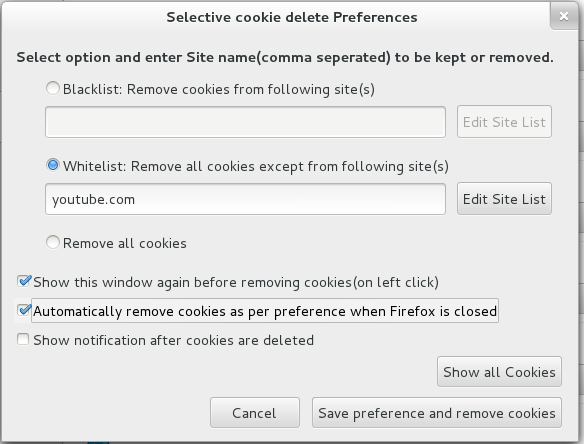 It assumes we want to remove all cookies when we close Firefox and that all cookies from YouTube will be accepted (or “Whitelisted.” This method is therefore less effective than method two, as there will probably be other cookies relating to advertising etc from YouTube stored as well as the HTML5 trial cookie. However, you won’t need to take any further steps or routines relating to the this topic once you are done. Once you have followed this guide, you will be all set to forget about this issue (or at least until you next upgrade your browser when you may need to await add-on compatibility). 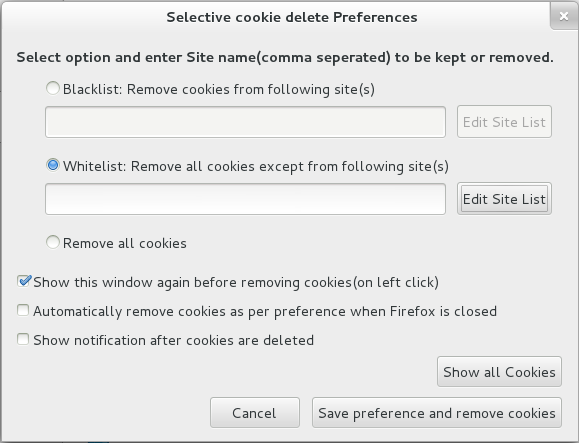 For this method we will use Selectivecookiedelete, which is licensed under the GPL compatible Mozilla Public License 1.1. …and click to join the html5 trial. If you wish to add other sites to this list, you may do so, for example, I would be happy to permanently keep cookies from my FSFE blog by adding blogs.fsfe.org to my whitelist. I know that these cookies are mostly related to my blog preferences and I know that FSFE is not / unlikely to be using cookies in a way that is unacceptable to me. However, I am less happy with stroring google’s cookies (even though I use their services every day) because Google has a poor privacy record. You will see cookies from most sites appear in the list after you have visited them, so you may want to check back here a few times over the next few days and see who else you wish to whitelist. Click Update Sites when you are done with this stage. 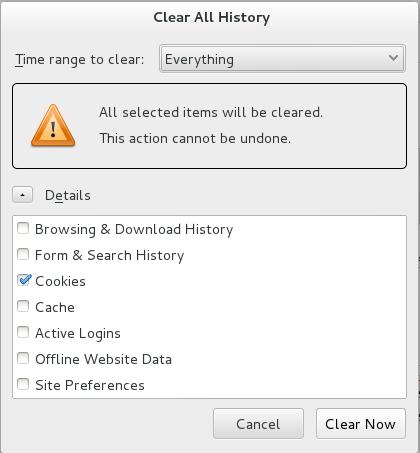 We need to check the “Automatically remove cookies ….” box. This means that all cookies, except those on our whitelist, will be deleted when we close our browser. Note that it may still be worth removing cookies periodically while you are still using your browser, for example, while you are browsing shops on-line. You do this by going Tools > Selective Cookie Delete > Show Preferences > Shave preferences and remove cookies. One reason for clearing cookies mid-session rather than only at the end is that there have been reports in the news of, for example, airline companies using cookies to artificially inflate prices. However, bear in mind that your shopping cart contents and previously viewed products may also be based on cookies so you need to take steps to avoid losing the links to products you want to buy. We need to look down the list for “Cookies Manager +” and click the install button. Once you have restarted go to Tools > Cookies Manager+ and you will see the Cookies Manager+ Dialogue appear. First of all, you are going to clear all your cookies so you can start afresh. To do this, tick the Select All box on the top left of the list of cookies. Then click on Delete. Now close this Cookie Control+ window. 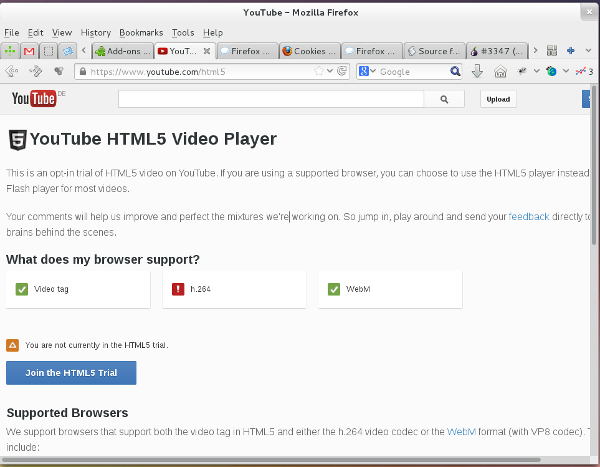 Now, you need to go to www.youtube.com/html5 to join the html5 trial. This action has set a preference cookie on your hard drive: this means that each time you visit YouTube the website will recognise you as a brilliant and forward thinking individual (and you will see videos in HTML5). You can, using Cookie Manager+ see this cookie. 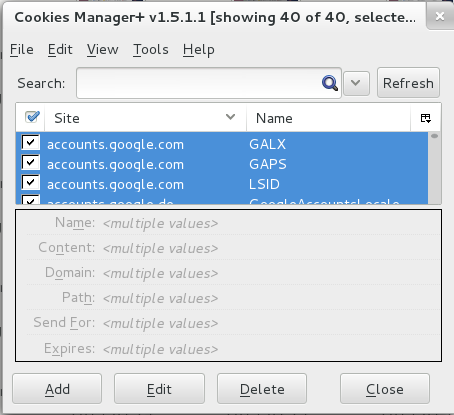 Go to Tools > Cookies Manager+ and you will that several new cookies have appeared. One of them is from youtube.com and is labelled PREF. This is the cookie that we want to always keep when we detele our cookies, because this is the cookie that ensures we view YouTube videos in HTML5 when possible. We now go to File > Backup/Restore > Backup Selected and choose a good place to store our cookie. I made a new folder called “cookies_i_like” in my documents folder. Then, to try out our new backup and restore system, we must delete all our cookies again and restore the html5 cookie using our new backup file. First of all, tick the Select All box on the top left of the list of cookies and click Delete. We then need to find our backup file that we made earlier, select it and click open. Our html5 trial cookie will then be resorted and we will continue see YouTube videos more freely by default. Method Three? You tell me! If you are an expert, please get in touch! 1) For GUI users this add-on seems better because it can no only isolate the exact cookie, but can automatically restore it (rather than the manual restore you need to use in method two): however, I could not get that feature to work, and still had to manually restore. 2) I found a script to isolate and keep the HTML5 trial cookie, however, I have no idea how to use it. Is this script effective? Could you write a beginners guide in how to use it? 3) Could this be built into Firefox? There was some discussion in the Tor project about building HTML5-trial into the browser: given that Firefox has worked so hard on HTML5 video, could we ask for trial inclusion to be the default? 4) Who can write guides for other browsers? 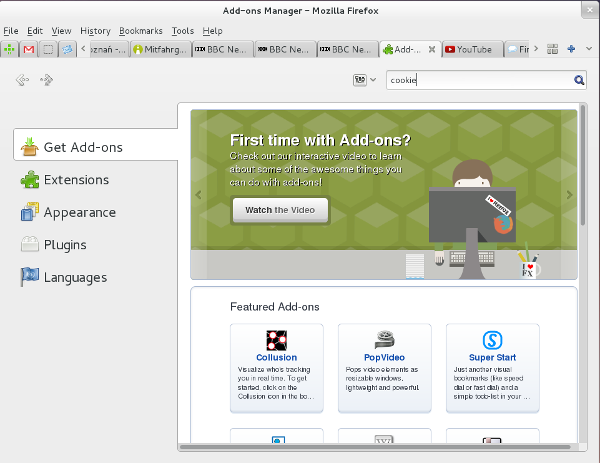 So far I have had little success with HTML5 video in Chrome, however, if you know more, a guide would be great! Also, here is some information about the issue in Seamonkey. 5) What about Vimeo? I have also had very little success watching HTML5 video on Vimeo – what about you? Could you write a guide? Is HTM5 video in Vimeo cookie based too? Which other in/out cookies should we think about keeping? You may wish to look at locating and keeping the cookie mentioned in this video. This cookie is involved in disabling targeted advertising (but it doesn’t stop the data collection in the first place). This entry was posted on Thursday, June 6th, 2013 at 1:41 pm	and is filed under html5, Uncategorized. You can follow any responses to this entry through the RSS 2.0 feed. You can leave a response, or trackback from your own site.